7am on the last Saturday of the Holidays! I’ve been awake since 3am in that dozing, half existence of: “ooh I’ll just listen to one more item on the World Service…. Wow is that the time?… Dog… husband… cats – WHOEVER YOU ARE…. (and you know who you are) STOP SNORING, God-dammit! Rover had posted quite succinctly, I felt, that he would count Daleks (to help him sleep), but there’s never an invasion fleet when you need one, but I noticed he too was snoring, and not in need of the replies that trickled in from fellow insomniacs. I’d like to thank those of you out in Twitter-Land at these twilight moments for your company. By Monday Morning, I shall be back to the Zombie state I had so enjoyed in the last fortnight of term. Why….The return to school time of year. good run in to the weekend and time for a spot of cleaning, slobbing, writing etc.. etc. What we didn’t factor in was my dodgy stomach. This meant we travelled back on the 3rd. It’s a five hour journey. Well Dog needs rest breaks, As you know – from the last post – he’s a puppy of ingrained habits and movements. The fact that Green likes to make the trip back from Wales exciting. Green is our Caddy Van. Manhandling the whole of HQ and a dog needs more than an estate car! Last year, Green had clutch and gear trouble on the way up and the clutch gave up 20 minutes into the journey home, leading to a very large bill. This year : Well I think the picture says it all, don’t you? There are three wheels on my wagon. Steve said afterwards he was impressed I didn’t panic. What was the point in panicking? Rover has Kofi Annan’s number on speed dial. And I didn’t want an entire UN Peacekeeping force turning up on the hard shoulder of the M54 to remind me I’d been derelict in my duty of care to my cats and Dog. 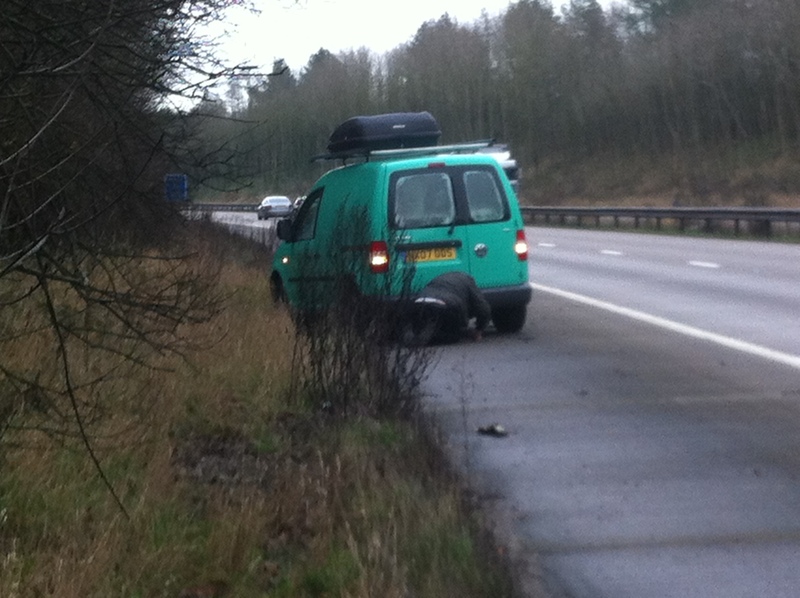 I got Green into the inside lane, and from there onto the hard shoulder. By which time, the tyre was shredded – though I reckon with enough gaffer tape and plumber’s guck and some sticky back plastic we could have rebuilt it. Parking at a jaunty angle (as you can see) to afford Steve some protection from the oncoming traffic. I donned the high viz jacket of power and willed myself to keep warm while he did battle with the spare tyre. Boy was it a longer battle than it should have been. Eventually, the spare tyre was released from its “prison” under the van. The tyre was changed and we continued on our way. I would like to thank all the people who moved out and slowed down. It was much appreciated. I would also like to thank Green for ensuring that in the longest month of the year I had to spend out £55 for a new tyre. Now there’s an interesting concept for a blog!! !